My boiler is almost 5 years old with no issues, but has had a few "Failed Ignition" errors in the last few days . I did some searching on this site and found other information mentioned around a possible bad ignitors. This boiler is on it's original ignitor and has 36,000 ignitions between DHW and CH. I just ordered 2 as I assume this wall will advise me to replace it (the installer didn't mention this for preventative maintenance) and then I'll have a spare. I also completely cleaned the condensate drain as it was pretty full of residue. Everything ran normal for another 46 hours with no errors when I heard a loud racket in the garage, investigated and the boiler was vibrating violently and making a lot of noise. I didn't video that incident but did record a minor one which is more of a pulsing sound with less violence, but file attach and image attach didn't allow me to attach it here. Does anyone know what that noise is, is this all related to ignition or something else? 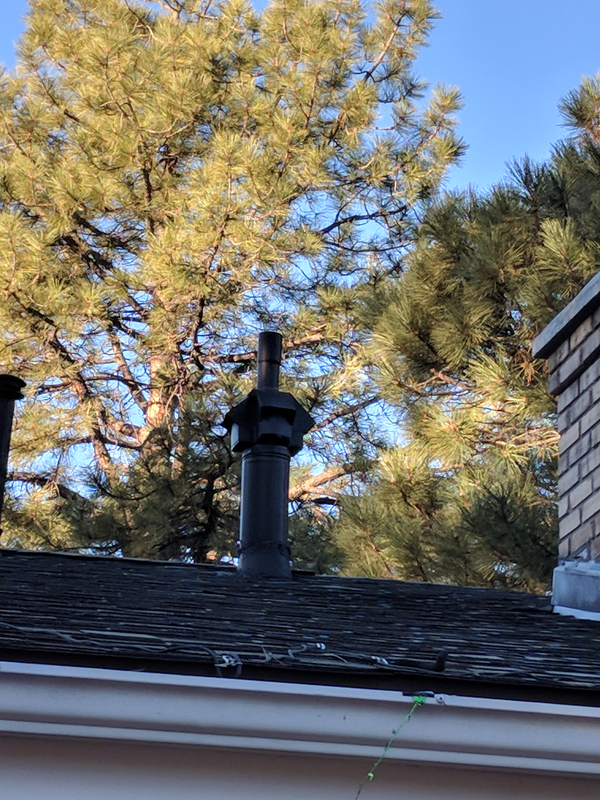 I appreciate any help, and am also curious what damage could be done by these combustion issues or whatever they are. Also if anyone knows how to attach an Android VID file here let me know so you can hear it. Sounds like the venter fins may have broken up. Take the grey elbow off and look into the venturi towards the venter. You may or may be able to see the issue. Best then would be to remove the venter and inspect it, and the combustion chamber. The installer inspected the elbow and it was only slightly roughed up and he said the fins were fine...he did pull the ignitor and clean it with scotch brite and reinstalled and said he would pull the combustion chamber apart and inspect if I wanted but he didn't think we need to (and didn't). The unit ran fine for another day. 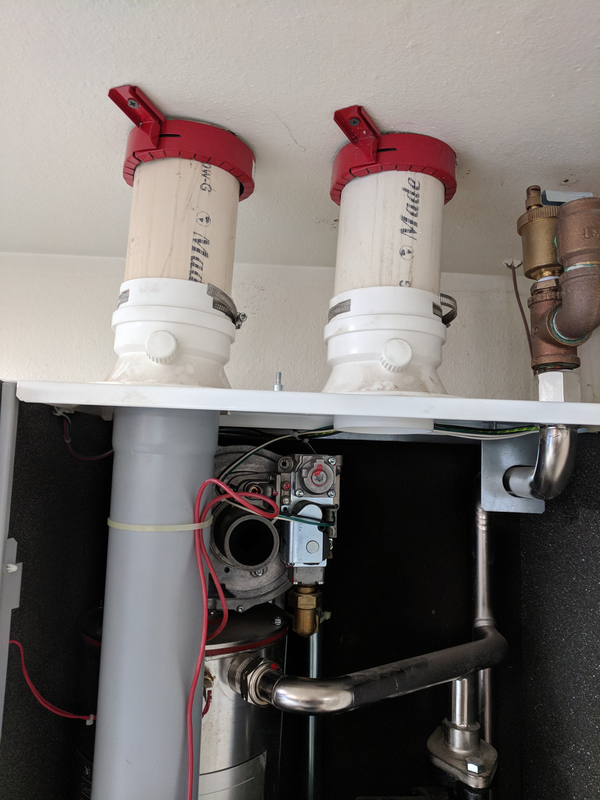 Noise happened yesterday and I tapped the Grundfos internal pump and the noise stopped but I don't really know if that was the source. The pump is quiet, if bearings were going bad wouldn't I hear it all the time? Pictures attached, let me know if others needed. Of note when this first happened I did find the exhaust screen was cocked in the PVC roof penetration at the top (on roof) but no signs of critters in any vents but I can't see in that sealed 90 in the attic. Was the screen turned like something could have gotten in? If so I would cut open the exhaust pipe in between those 2 90*'s. Then take the pipe off on top of the boiler and confirm nothing made it all the way down to the bottom. 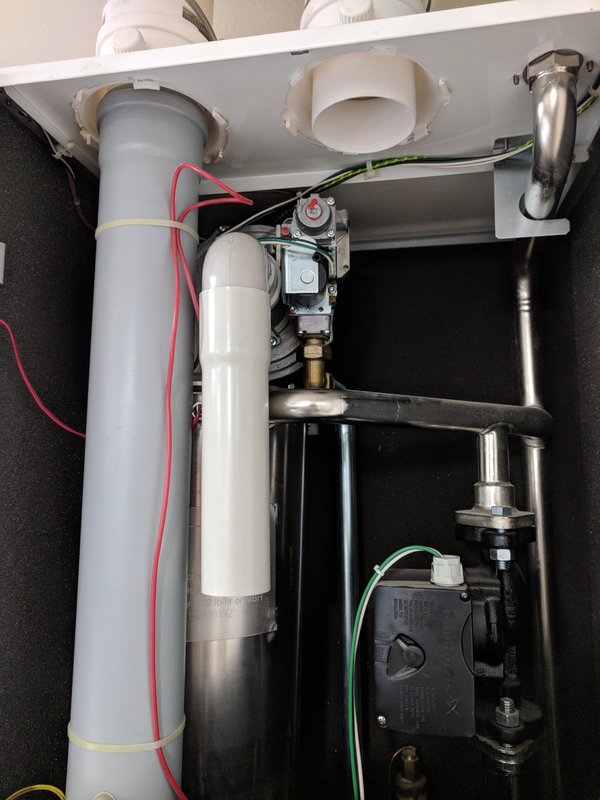 I believe on that model you can also peek up from where the condensate drain trap is, just unscrew the trap and remove. You should be able to look up and see the piping. Any blockage/resistance in either the air intake or exhaust greatly affects it's operation and will cause some of the issues you are having. 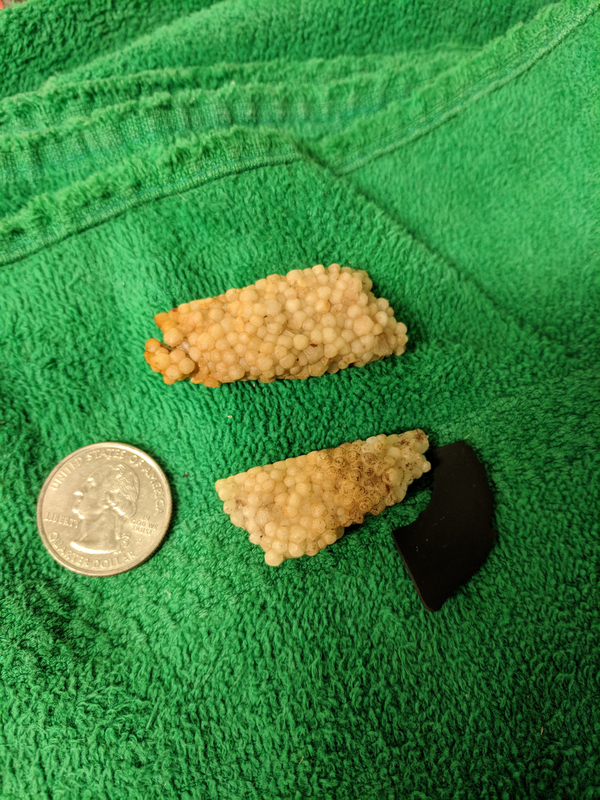 I just got back on a same type of a issue today, found a nest of helicopters/sticks......I don't know what that is that you found in yours, eggs? 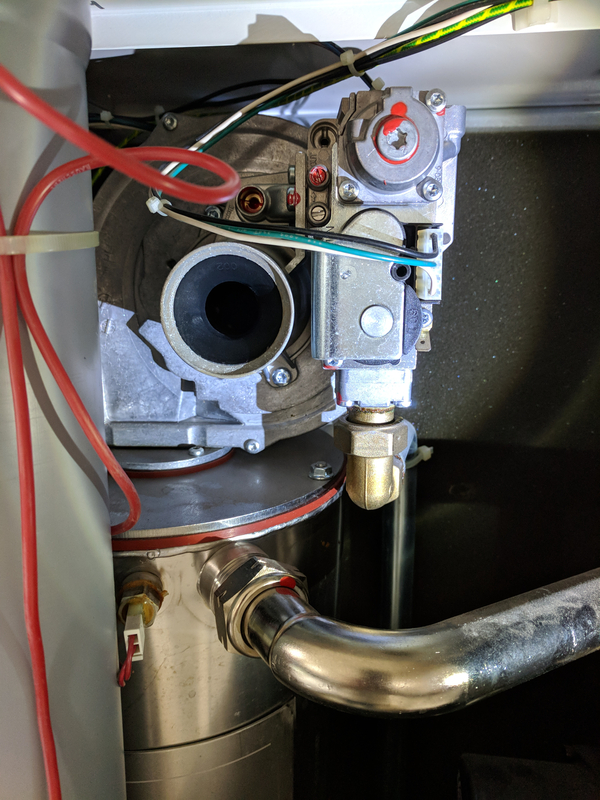 Is there enough room to lift the exhaust pipe off on the top of the boiler without cutting? Here is the video, the vibration and noise escalates until the unit was turned off at the very end. The next time the event is happening or now? It has been on high since the install 4.5 years ago. You can leave it on high. Don't think the pump is your issue. Is that black piece that you found plastic???? Can you get your tech back with his combustion analyzer? If it hasn't had it's mixture checked in 4+ yrs it's due. Perfect timing, I've had the unit off to take those pictures, fired it up and the noise started from cold start. I switched the pump to Med and nothing changed, switched back to Hi. I touched the gray elbow to the venture and it stopped but I didn't really feel anything. I'll try to locate the source better next time. When it starts making the noise again, take your hand and slowly cover the gray elbow until the sound stops. The venturi appears worn in the 2nd picture. Unusual due to the way it is piped but is possible. I would inspect everything including the fan. Combustion analysis should be on the list. Sometimes you can get a noise like that that is caused by harmonics in the gas line. How close is the boiler to the house regulator( at the meter). Does the regulator hum like that? Fully agree combustion analysis needs to be done. But it looks like there maybe some repairs needed, possibly fan, venturi, or exhaust cleanout. Any of these can cause the noise issue. Gas is also a possibility but the noise actually sounds like a rattle. Like bad/broken fan fins. If a slight restriction on the venturi works then a venturi replacement will be necessary. 1. On top of the unit the air vent cap is loose as it should be and the emergency pressure relief works (checked these first). 2. the venter fan spins freely and smoothly but feels loose, it will wiggle or flex away when pressed carefully with a screw driver. 3. Foghorning: unit has done this from the beginning of time but has gotten louder. I didn't know what it was called but it sounds like a horn to me and have mentioned it since the install. 4. Debris in condensate drain trap: 2 pieces of Styrofoam, and black is soft flexible rubber. Tech thinks the foam may be from original packaging as he found a small piece in the cabinet. The intake is completely clear. The exhaust looks like a healthy smoke stack in the cold of the morning. I just shined a flashlight down the exhaust and I see standing water at that first 90 from the top.That looks bad. Assume I should cut that 90, drain it and reinstall at an angle down instead of a flat square double 90??? 6. The gas supply meter is 60-80 feet from the unit and is quiet right now. I could check again next time this happens which may be soon as I'll do another cold start up. If this unit has never been set up properly (foghorning from beginning tells me this) than you need someone in their with the proper equipment to start. I would recommend finding someone with an analyzer, have them contact tech support while on site and have them walk through the initial setup. Foghorn sound is caused by the readings being out of balance.. it will never get better without proper adjustments.. I would also keep a very close eye on the pvc venting. Discoloration is an indicator it has been running to hot. You may wish to look into having it replaced.. Yes you are correct should not be any water in that pipe. Chances at good that something is holding the water in the pipe. Thank you to everyone for the ongoing tech support - as you can tell I need it due to the newbie factor! A few more details, I am at elevation as Flagstaff is at 6800 feet. I will ask my tech to read this information you all have posted, and I will make some calls Monday to figure out if someone local or close has a combustion analyzer that can be used while talking to TT tech support. Here is an image of the small PVC elbow venter intake with discoloration. Forgot a few other details, the 2 90s in the exhaust PVC are in an attic at ambient temp so it gets freezing temps every night here. 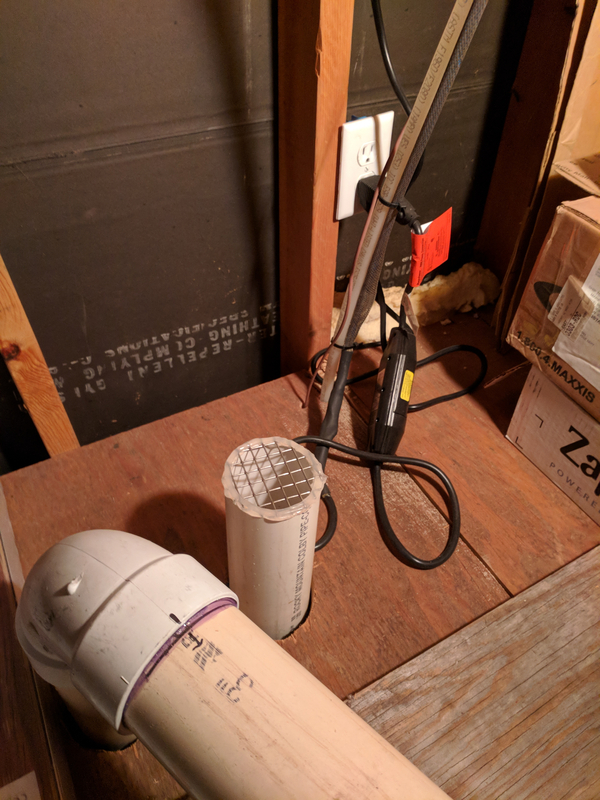 I drained a few gallons from the condensate drain trap over the last hour but will replace the 2 90s with 45s or something to create a slope to the drain trap soon. Harmonics started again (thanks Zman) and per Dennis I slowly restricted intake flow with my hand and yes the harmonics stopped. A few moments later I removed my hand and the unit continued to run smoothly. So this means the venturi needs replaced per Dennis statement above? With less air at time of ignition the unit works better so Zman called it and it may be running lean on the gas/air mixture here at 6800 feet elevation. Happy Super Bowl Sunday everyone, I hope we all get a good game, and as a Broncos fan I hope the Eagles pull off a stunner! Update 2/7: - got the exhaust replaced with 45s and a nice slope Tuesday. 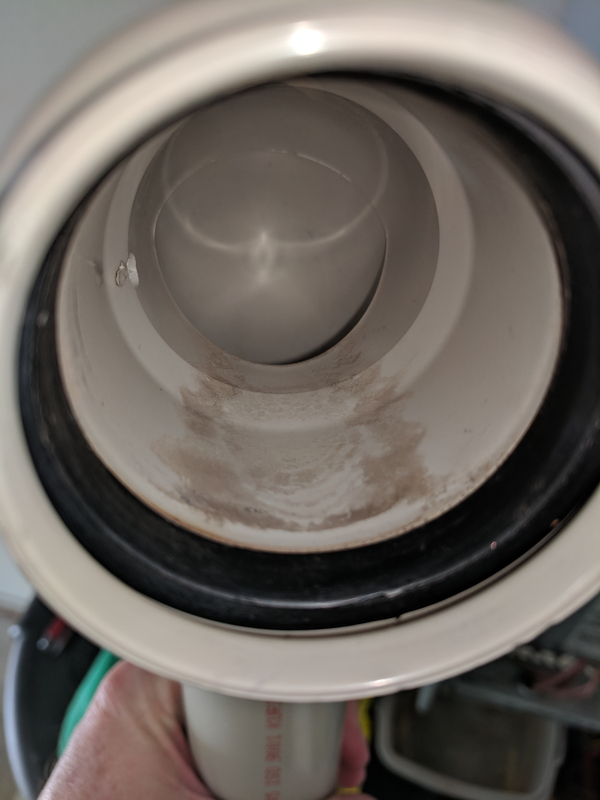 - tech used brush in bottom of unit from condensate drain and cleaned a few large bugs out but no nest or significant debris in there (as much as you can tell without being able to see anything) or the exhaust flue. Assuming the original 90s were just too flat and water accumulated. - unit worked good at start up after that, tech verified some parameters with settings from TT, CO in exhaust stack I believe and checked something in the gas valve that was acceptable. - at lunch today, turned unit on and got a slower pulsing of the original but similar, see video below. As typical, this happens at cold start during ignition cycle. This time reducing flow with my hand didn't affect it, event lasted a few minutes and then went away. Way less violent than original video at top of this post. - Dennis: do you still believe this has something to do with the venturi, and if so what is happening with the venturi to cause this? - any other ideas out there? 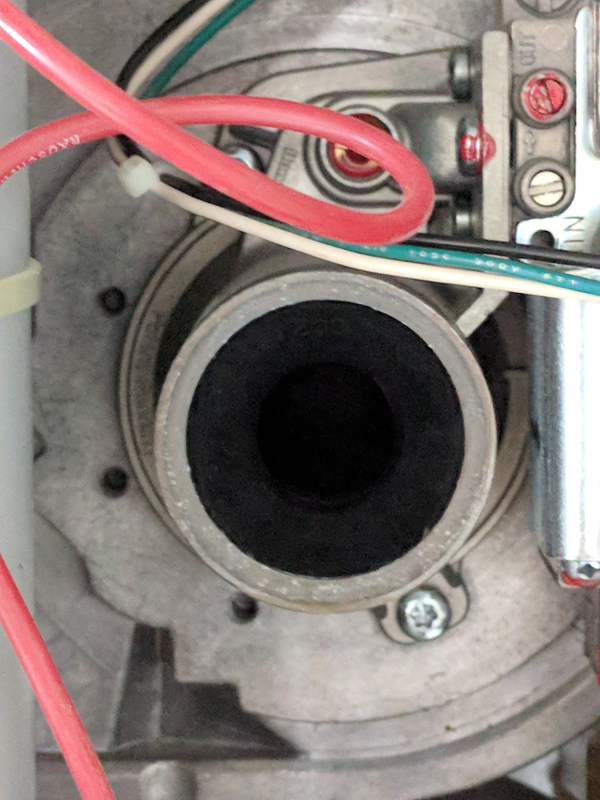 Can't see the venter fan very well through the venturi hole so could disassemble to fully inspect? Also, when checking the information menu I do have a few "sensor drift" errors the manual describes as "supply or return sensor reading has drifted." But I have seen that when I start it back up after turning it off manually a few times on the display. Just to be clear, after this video pulsing stops shortly after start up the boiler runs great completing DHW cycles and the CH cycles for hours. Typically the cold start up when its been off for extended periods during the night etc is when this happens. It's hard to see in the pictures but it looks like there is deterioration on the right side of it. Would be unusual because usually re ingestion of exhaust gasses cause the deterioration. In your case that is not probable. Inspection of the blower and burner chamber should still be done. How long is your intake pipe, and does it still do it with the door on? Sensor drift can be caused by improper piping or flow of water. Still does it with the door on, I just took it off for the hand remedy and videos. I put the door back on after this new tech work but took it off when it happened again. 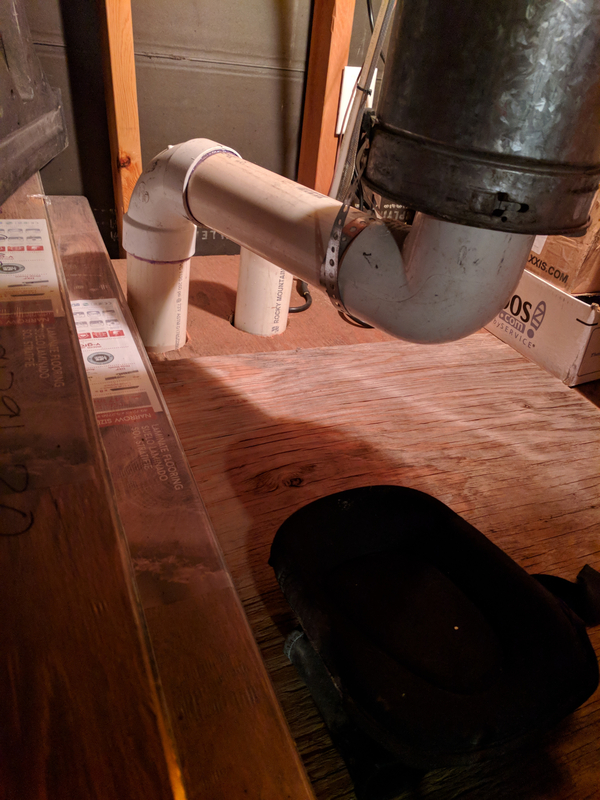 The intake pipe is 26" from cabinet up to the open attic. The attic has a plywood floor, lots of open vent space and at outside temp. We can do the inspection of the blower and burner chamber. Is the venturi in perfect condition? No pitting, no scuffing, no chips, no scratches, no black deterioration happening, solid does not move in the aluminum housing? That is a very precise instrument and it needs to be in perfect condition.